Once you decide to install your beautiful new slate floor tiles, what is the best way to protect them? Slate may seem hard as a rock, which it is, yet it can be porous allowing liquids to stain the surface. Slate is a metamorphic rock with varying degrees of porosity depending on the source. Flooring experts recommend clear sealant to prevent staining that can permanently spoil the natural beauty of the material. 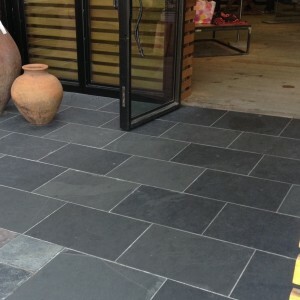 Besides protecting the slate from staining, the sealant can add a shiny or matte appearance to the floor. When Should You Apply the Sealant? One common question pertains to when the sealant should be applied during a new installation. Should the this be applied before grouting or after? According to MyBuilder.com, the sealant process is best before grouting since the sealer will prevent errant grout and adhesive from affecting the appearance of the slate. These materials can be more easily removed from tiles that have been stained already. However, with existing slate tile, the sealant should be added only after the tile and grout have been thoroughly cleaned. According to thefloorlady.com, keeping the area free of excess dirt and dust is essential. Cleaning the even subfloor before laying the tiles is important. Scrub the new slate tiles completely before adding a high-quality sealant. Apply the sealer with a brush, roller, or sprayer in thin coats. Follow the drying directions for the product carefully before applying the second layer. There are several quality sealers in the market, but a clear water-based product is lower in VOC (volatile organic compounds) and is considered safer and more environmentally positive. Follow the grain of the slate to ensure proper coverage. Select a sealant that matches your preferred “look.” Whether you desire a duller, matte finish or a shiny, glossy one, sealants are available to match your preference. Carefully lay the tiles after sealing and drying, making sure the spacing is appropriate and there are no irregularities in the subfloor. Use enough mortar to ensure stability and adherence. Once the slate tiles are in position and the adhesive is dry, the grouting process should begin. One recommendation is to mix the grouting material with penetrating sealant to improve the tensile strength and water resistance. Allow the grout to dry for up to seven days and then clean the tiles thoroughly. Make sure all excess grout is removed. Apply two more coats of sealant and finally let the surface cure fully before using for a beautiful, long-lasting appearance. For answers about the installation and the tile sealing process for high-quality slate flooring, phone the experts at PetraSlate in Denver at 303-280-9595.